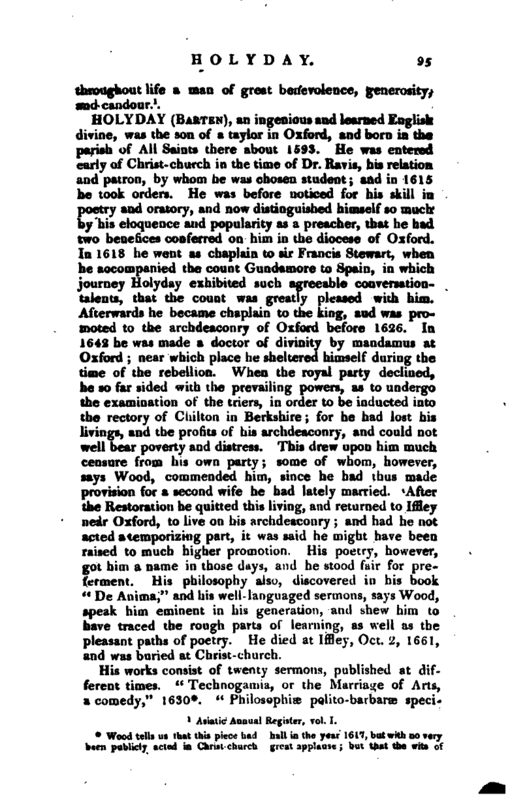 , a learned English gentleman, well known in the history of British India, was the son of Zephaniah Holwell, timber-merchant and citizen of London, and grandson of John Holwell, a mathematical writer of much fame in the seventeenth century. The father and grandfather of this John Holwell both fell in support of the royal cause during the usurpation, and the family estate of Holwell-hall, in Devonshire, was lost to their descendants for ever; for although Mr. Holwell applied to king Charles at the restoration, the only recompense he obtained was to be appointed royal astronomer and surveyor of the crown lands, and the advancement of his wife to a place of some honour, but of little emolument, about the person of the queen. Some years after he was appointed mathematical preceptor to the duke of Monmouth, for whom he conceived a warm attachment, and, believing him to be the legitimate sou of the king, was induced to take a very active and imprudent part against the succession of the duke of York, which in the end proved his ruin. Having published in 1683 a small Latin tract called “Catastrophe Mundi,” which was soon after translated, and is a severe attack on the popish party, he was marked for destruction as soon as the duke of York | came to the throne. Accordingly, in 1685, it was contrived that, in quality of surveyor to the crown, he should be sent to America, to survey and lay down a chart of the town of New York; and at the same time secret orders were sent to the government agents there, to take some effectual means to prevent his return. In consequence of this, it is said, that he had no sooner executed his commission, than he died suddenly, and his death was attributed, at the time and on the spot, to the application of poison administered to him in a dish of coffee. His son was father to the subject of the present article. 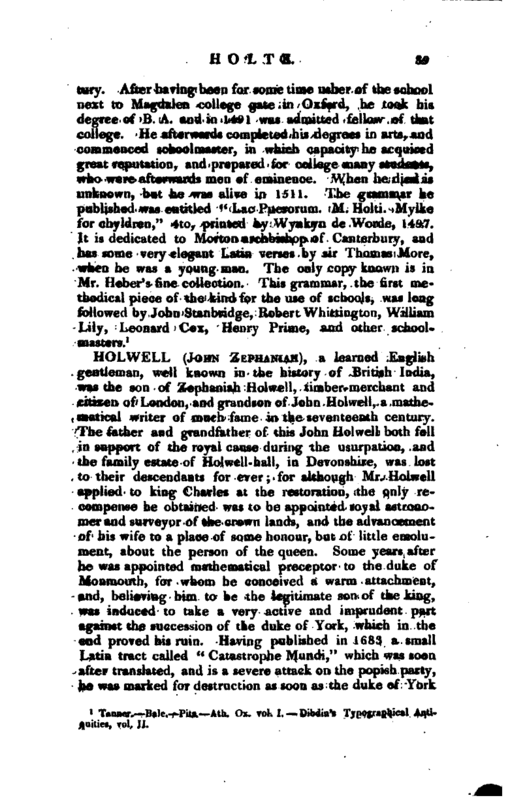 John Zephaniah Holwell was born at Dublin, Sept. 17, 1711, and at the age of eight was brought over to England, and placed at Mr. M’Kenzie’s grammar-school at Richmond in Surrey, where he distinguished himself in classical learning. After this, his father having determined to breed him up to mercantile life in Holland, sent him to an academy at Iselmond on the Meuse, where he learned the French and Dutch languages, and was instructed in bookkeeping. He was then placed in the counting-house of Lantwoord, a banker and ship’s-husband at Rotterdam, with a stipulation that he was to be admitted as a partner at the expiration of five years. The unceasing toil, however, of his new situation soon affected his health to a very alarming degree; and although he recovered by consulting the celebrated Boerhaave at Leyden, his inclination for trade was gone, and on his return to England, his father, finding him inflexible on this point, bound him apprentice to Mr. Forbes, a surgeon in the Park, Southwark, and upon the death of that gentleman he was placed under the care of Mr. Andrew Cooper, senior surgeon of Guy’s hospital. 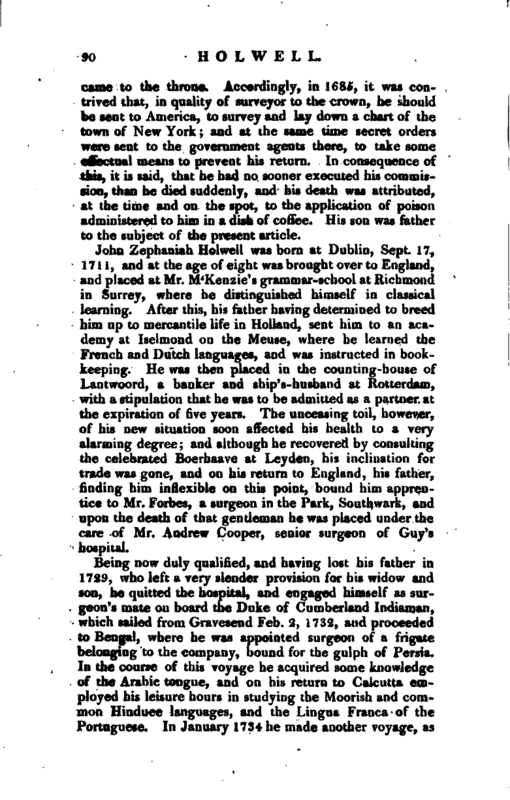 Being now duly qualified, and having lost his father in 1729, who left a very slender provision for his widow and: son, he quitted the hospital, and engaged himself as surgeon’s mate on board the Duke of Cumberland Indiaman, which sailed from Gravesend Feb. 2, 1732, and proceeded to Bengal, where he was appointed surgeon of a frigate belonging to the company, bound for the gulph of Persia. In the course of this voyage he acquired some knowledge of the Arabic tongue, and on his return to Calcutta employed his leisure hours in studying the Moorish and common Hinduee languages, and the Lingua Franca of the Portuguese. In January 1734 he made another voyage, as | aurgeon of the ship Prince of Wales, to Surat, &c. and soon after his return to Bengal, he was appointed surgeonmajor to the Patna party, usually consisting of about 400 European infantry, which annually left the presidency in the latter end of September, with the company’s trade for their factory at Patna. His next voyage was in the ship Prince of Orange, to Mocha and Judda in the Arabian gulph. During nis stay there he added to his knowledge of the Arabic tongue, and on his return to Calcutta was able to speak it with tolerable fluency. After another visit, however, to Patna, as surgeon -major, he was anxious to quit this rambling life, and by the interest of his friends was appointed surgeon to the company’s factory at Decca; and here, besides farther improving himself in the Moorish and Hinduee tongues, he commenced his researches into the Hindu theology. At the close of the year 1736 he returned to Calcutta, and was elected an alderman in the mayor’s court; and in 1740 was appointed assistant surgeon to the hospital, which first gave him a solid establishment in the company’s service. In 1746 he succeeded to the place of principal physician and surgeon to the presidency; and in the years 1747 and 1748 was successively elected mayor of the corporation. In Sept. 1749 his bad state of health rendered it necessary for him to return to England, where he arrived in the March following. During this voyage he had leisure to arrange his materials on the theology and doctrines of the ancient and modern Brahmans, and to digest a plan which he had formed for correcting abuses in the Zemindar’s court at Calcutta. This scheme of reform he submitted to the court of directors, who, in consequence of the advantages it promised to produce, appointed him perpetual Zemindar, and twelfth, or youngest, in the council at the bpard of Calcutta; but with an exception to any further advancement in it. On his arrival in Calcutta, in August 1751, he immediately began his system of reform, which gave so much satisfaction to the directors, that the exception against his rising in the council was removed, and 4000 rupees added to his salary. The nature and object of this reform is fully delineated in his “India Tracts,” a 4to volume, which he published at London in 1764. At the time of Mr. Holwell’s death in 1798, there were two survivors of that horrible tyranny, in England: Mr. Burdett, residing at Totton near Southampton, and Capt. Mills on the Hampstead-road. The latter, who, if we mistake not, is still living, is the genmistake not, is still living, is the gen tleman who, as mentioned in the narrative, manifested the truest friendship, by resigning his station near the window of the dungeon to Mr. Holwell, who otherwise must have expired in a few minutes. On his delivery from this place he was carried in irons to Muxadabad, but was released on July 31st following, by the intercession of the Begum, Surajah Dowlah’s grandmother, who was influenced to this act of compassion by the reports of his upright and lenient conduct to the natives during the time he presided in the Zemindar and Cutcherry courts. He soon after joined the wretched remains of the colony at Fultah. In December following the presidency was retaken by vice-admiral Watson and colonel Clive, and the governor and council re-established by them. 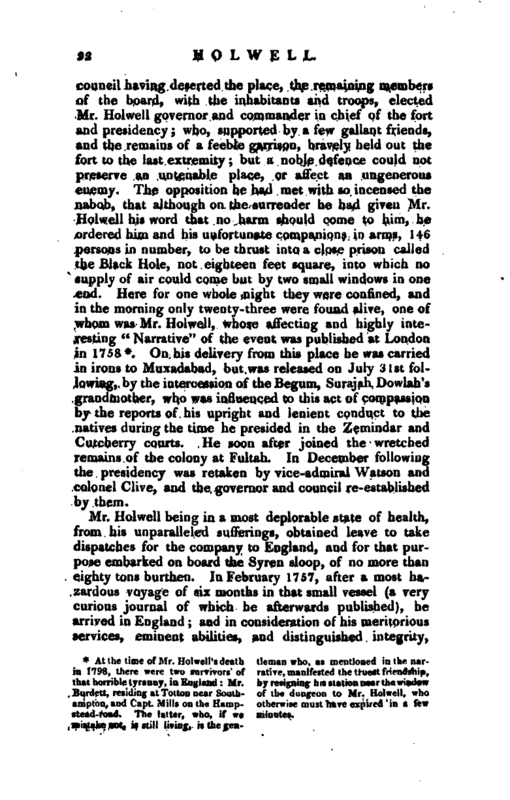 Mr. Holwell being in a most deplorable state of health, from his unparalleled sufferings, obtained leave to take dispatches for the company to England, and for that purpose embarked on board the Syren sloop, of no more than eighty tons burthen. 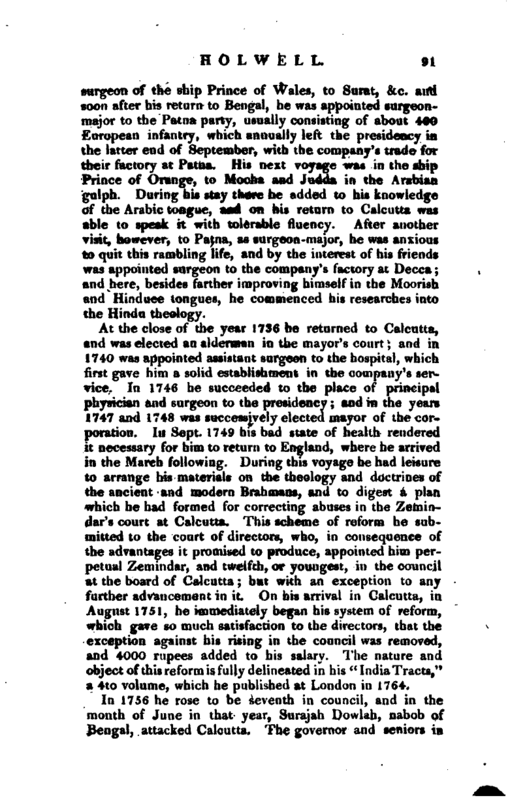 In February 1757, after a most hazardous voyage of six months in that small vessel (a very curious journal pf which he afterwards published), he arrived in England; and in consideration of his meritorious services, eminent abilities, and distinguished integrity, | was appointed, by a majority of fifteen against nine, in the court of directors, to return to Bengal as successor to colonel Clive in that government; but this appointment he, with great modesty, declined in favour of Mr. Manningham. He was then named second in council, and successor to that gentleman. In this situation he embarked on. 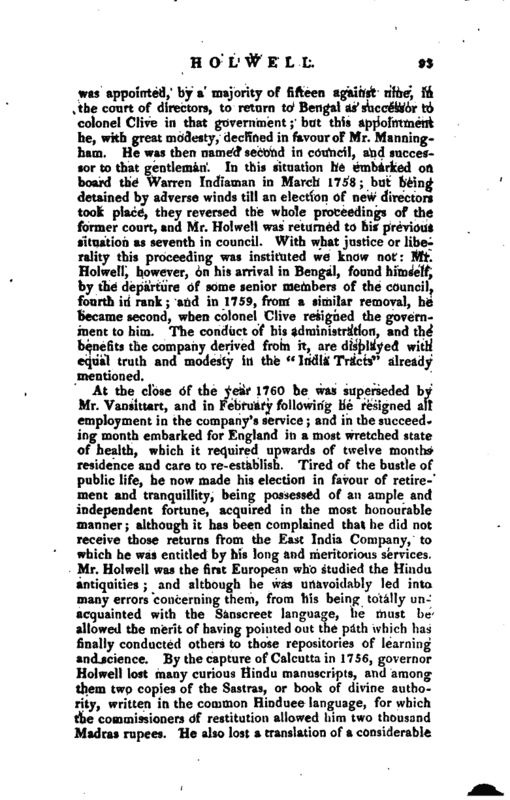 board the Warren Indiamau in March 1758; but being detained by adverse winds till an election of new directors took place, they reversed the whole proceedings of the former court, and Mr. Holwell was returned to his previous situation as seventh in council. With what justice or liberality this proceeding was instituted we know not: Mr. Holwell, however, on his arrival in Bengal, found himself, by the departure of some senior members of the council, fourth in rank; and in 1759, from a similar removal, he became second, when colonel Clive resigned the government to him. The conduct of his administration, and the benefits the company derived from it, are displayed with equal truth and modesty in the “India Tracts” already mentioned. At the close of the year 1760 he was superseded by Mr. Vansittart, and in February following he resigned all employment in the company’s service; and in the succeeding month embarked for England in a most wretched state of health, which it required upwards of twelve months residence and care to re-establish. Tired of the bustle of public life, he now made his election in favour of retirement and tranquillity, being possessed of an ample and independent fortune, acquired in the most honourable manner; although it has been complained that he did not receive those returns from the East India Company, to which he was entitled by his long and meritorious services. 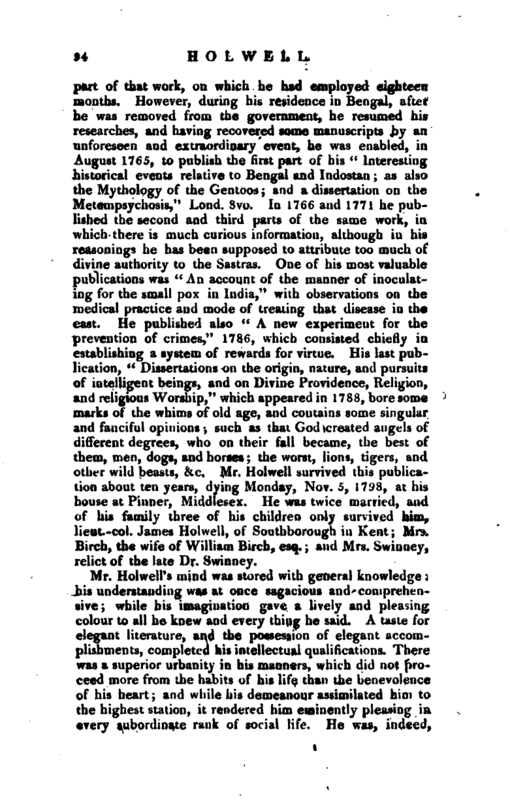 Mr. Holwell was the first European who studied the Hindu antiquities; and although he was unavoidably led into many errors concerning them, from his being totally unacquainted with the Sanscreet language, he must be allowed the merit of having pointed out the path which has finally conducted others to those repositories of learning and science. By the capture of Calcutta in 1756, governor Holwell lost many curious Hindu manuscripts, and among them two copies of the Sastras, or book of divine authority, written in the common Hinduee language, for which the commissioners of restitution allowed him two thousand Madras rupees. He also lost a translation of a considerable | part of that work, on which he had employed eighteen months. However, during his residence in Bengal, after he was removed from the government, he resumed his researches, and having recovered some manuscripts by an unforeseen and extraordinary event, he was enabled, in August 1765, to publish the first part of his “Interesting historical events relative to Bengal and Indostan; as also the Mythology of the Gentoos; and a dissertation on the Metempsychosis,” Lond. 8vo. In 1766 and 1771 he published the second and third parts of the same work, in which there is much curious information, although in his reasonings he has been supposed to attribute too much of divine authority to the Sastras. One of his most valuable publications was “An account of the manner of inoculating for the small pox in India,” with observations on the medical practice and mode of treating that disease in the east. He published also “A new experiment for the prevention of crimes,” 1786, which consisted chiefly in establishing a system of rewards for virtue. His last publication, “Dissertations on the origin, nature, and pursuits of intelligent beings, and on Divine Providence, Religion, and religious Worship,” which appeared in 1788, bore some marks of the whims of old age, and contains some singular and fanciful opinions, such as that God created angels of different degrees, who on their fall became, the best of them, men, dogs, and horses; the worst, lions, tigers, and other wild beasts, &c. Mr. Holwell survived this publication about ten years, dying Monday, Nov. 5, 1798, at his house at Pinner, Middlesex. He was twice married, and of his family three of his children only survived him, lieut.-col. James Holwell, of Southborough in Kent; Mrs. Birch, the wife of William Birch, esq. ; and Mrs. Swinney, relict of the late Dr. Swinney. Asiatic Annual Register, vol. I.